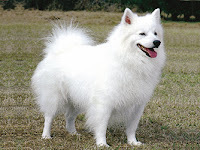 The exact origin of the American Eskimo Dog is unknown, although it is widely believed this companion dog originated in the United States by German immigrants in the 20th century. A Member of the Spitz family, the American Eskimo Dog comes in three different varieties: toy, miniature, and standard. They became extremely popular in the 1930's and 1940's as a circus performer.